I would like to be growing rockrose in our garden. We planted lots of it when we were Jolly Green Ranchers. The flowers are bold and delicate, both at once. And the shrub has a warm, almost evergreen fragrance that I love. Funny thing about spring... I never feel as keenly eager for this season as I do for autumn, or winter. But when it does arrive, when spring blossoms show, and trees bud, when thoughts turn to summer plans, and we think of lingering outdoors, then I am thankful. Thankful for spring, for beginnings and do-overs, for fresh starts, and pastoral romantic sentiments. Tea parties, picnic banquets, kittens, corsages, poetry, light bed sheets, open windows, dewy mornings, longer days, and skirts that twirl. Simplicity 1816, makes for satisfyingly twirly spring skirts. I've made two, and have plans to sew more. I've been surprised that I feel like sewing, because this cold has knocked me down hard, but evidently I have a sewing bug... and for the record: I am ridiculously amused with my little pun. Puns amuse, and bird prints delight me. And having two successful and successive sewing sessions thrills me. When I couldn't sleep, I decided to imagine a spring party... the very spring party I intended to host today. I closed my eyes, and planned every bit of it. It was less fun than having a garden full of friends, baking quiches, roasting potatoes, whipping cream to top fresh strawberries. But the clean-up was a breeze! There would have been table cloths, tea cups, and lemon bars. I think we would have done some crafting, maybe play at printmaking. I keep adding gardening... would you have minded very much if we asked for help making a pumpkin bed? I liked imagining that part. Happy spring, friends! I am looking forward to visits, and playdates, to seeing you here, and there. It will be nice to hear good things from you, to celebrate some special days that are coming soon. Over our broken fence... it's really only just a bit wobbly, never mind... you can see we have some flowers, and more, in our garden. I'm the opposite about the seasons. I don't think I will ever be eager for winter to arrive. Summer is my favorite—hot days and sunshine, lots of sunshine. Happy spring to you! I hope you get to have the party of your dreams soon. As always, your photos are wonderful. 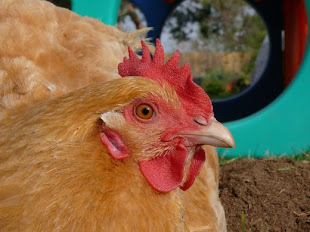 What a beautiful hen! I too like the friendship saying and could certainly use it as a reminder on how to behave!